Makin' Waves is a 1-vs.-3 minigame played in Mario Party 4. It is similar to the Mario Party 3 minigame Tidal Toss, but with the roles of the single player and the team reversed. 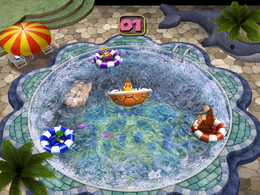 The camera shows a rowboat near the edge of a pool, between the solo player and two others. A wave rolls by and knocks the boat over as the scene zooms out, revealing the third player as the game begins. In this minigame, one player is on a platform in a large pool. The three team members are on small rafts on the edge of the pool. By Ground Pounding, the team can create waves that might knock the solo player over. The solo player must avoid this by moving around on the platform to balance the weight. The team wins if at any time the solo player falls into the water. However, if the solo player can stand their ground for thirty seconds, he or she wins instead. If the solo player wins, they do a victory dance while the other players sulk. If the three players win, they do victory dances while the solo player floats in the water. Game Rules – "The team players must pound the ground to make waves, while the lone player must try to balance on the shell." Advice – "Try making waves from different angles to rock the shell. The lone player might have to move in circles to stay on board." This page was last edited on March 31, 2019, at 17:40.